Nine months ago, Polaris announced a relationship with Robby Gordon and today we’re proud to introduce the first Robby Gordon edition, the all-new RANGER RZR 4. Before today, Sport Side-by-Side enthusiasts looking to carry multiple passengers had no option; that is no longer the case with the announcement of the industry’s first four-seat Sport Side-by-Side. 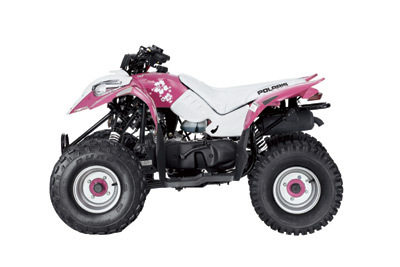 Polaris Industries today announced the company’s limited edition ATV offerings for 2008. ATV enthusiasts will be able to get “The World’s Toughest ATVs” in six limited edition packages. Polaris Industries ATV today announced its new hardest working, smoothest riding 2008 Limited Edition (LE) RANGER Side by Sides. The lineup includes five, customized models which will be available at select US and Canadian dealerships starting in February. Polaris has added the RANGER XP in Midnight Red to its 2006 limited-edition offering. Polaris Introduces ATV Sport Quadricycle Concept Many of the ATVs currently sold in Europe are homologated for on-road use as “quadricycles”. Minneapolis, January 31, 2006 – Polaris Industries today announced ten limited edition ATVs for 2006. As with all models, Polaris secured feedback from consumers, dealers, Way Out Training Team members and internal staff to help determine the 2006 LE models.